To promote cutting-edge scholarly research, the Wyndham Lewis Memorial Trust funds a yearly essay prize aimed at scholars working at the forefront of Lewisian studies. Submissions are welcome from anyone working on Lewis in a scholarly manner, though please note that the competition is not open to anyone who, on the date of submission, has held a PhD for more than two years. Evidence of meeting this condition will be needed. The prize is worth £200. 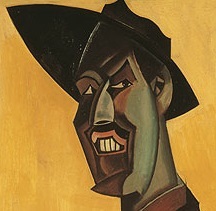 Winning essays are published in The Journal of Wyndham Lewis Studies (JWLS). Entries, which should be between 7,000 and 10,000 words long, can be on any aspect of Lewis's life and work, though entries relating Lewis in new ways to his contemporaries or to fresh cultural-historical contexts are encouraged. Those submitting work to be considered for the prize should send their essays to Nathan Waddell, a co-editor of JWLS,by email. Essays are judged anonymously by a panel of Lewisian scholars: Rebecca Beasley, Paul Edwards, Andrzej Gąsiorek, Louise Kane, Alan Munton, and Nathan Waddell. The deadline for this year's competition is 30th June 2017.